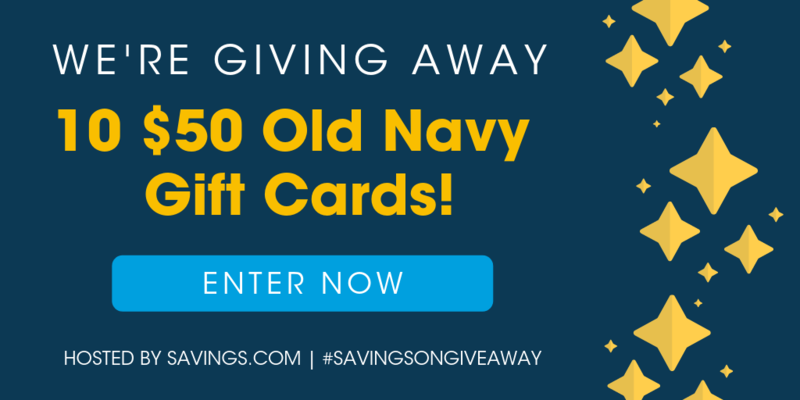 $50 Old Navy Gift Card Giveaway – 10 Winners | A Savings WOW! There are some really fantastic deals going on at Old Navy right now. A $50 gift card can go a long way! Enter the giveaway by heading to the Sears page on Savings.com and SUBMIT YOUR EMAIL ADDRESS ON THE FORM at the top of the page. The winners will be chosen through a lottery drawing and notified on Tuesday (11/27) via the email address they used to enter. See complete Official Rules for entry instructions, full prize descriptions, restrictions and other important details. Get 50% off at Old Navy today (November 26th) PLUS get free cozy socks with your order when you use the code found here.